There is no reason why even the smallest master bedroom can’t be relaxing, cozy, calming and beautiful. When square footage is limited, you want to use what you have. 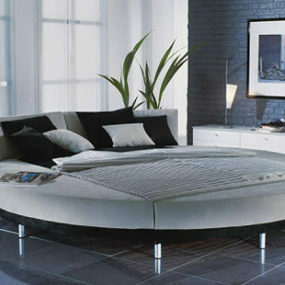 Keep the furniture scaled to the room, and most importantly decorate to your liking. Having a theme will make the space appear large and put together. The following tips and tricks will help you make the most of any size bedroom even tiny ones. The richness in brown adds to the soft appeal of crisp whites. If you want a less bold contrast use beige and off-white hues instead. These will have the same outcome but with a softer contrast between the two. Consider adding a bench to the room for an elegant addition. Looking for a sophisticated palette that works both the masculine and feminine side of décor? Look no further this is it. These colors work beautifully together. The key is using a bold shade of brown with crisp white hues. Add a chandelier and a patterned item or rug to pull the entire décor together. Built-in shelves are great! They are multi-functional versatile and will get the job done when needed. They also take up little to no space when you use them as part of your headboard decor. The idea is to work with pastel hues that bring everything together in the bedroom. Having a small room typically means the closet space is small as well. If that is the case built-in storage is the way to go. It will minimize the square footage while making the space look pulled together. 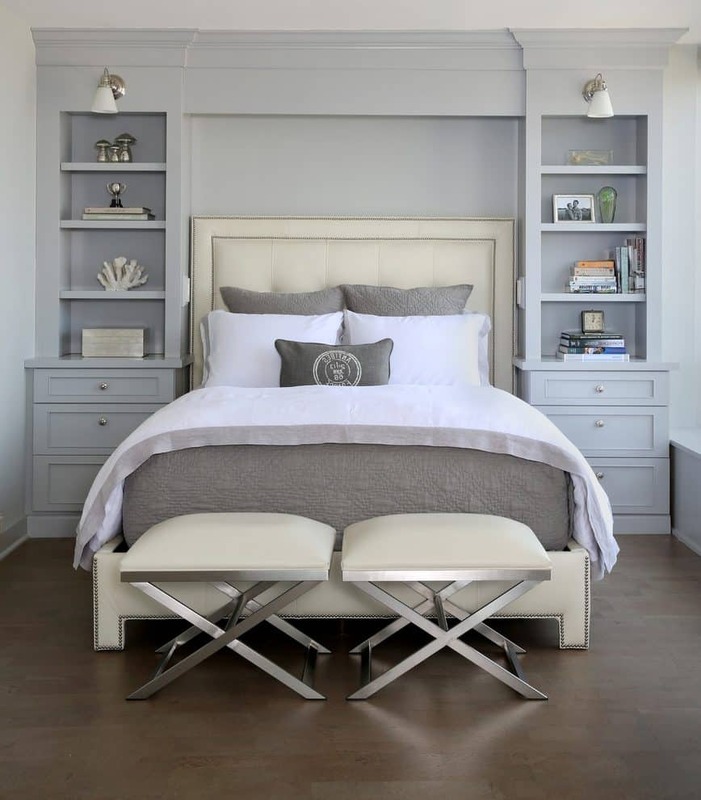 Create built-in shortage around the head of the bed instead of having a bedframe. It adds storage while bringing everything together at once. Navy is one of those bold colors that simply work anywhere it is placed. 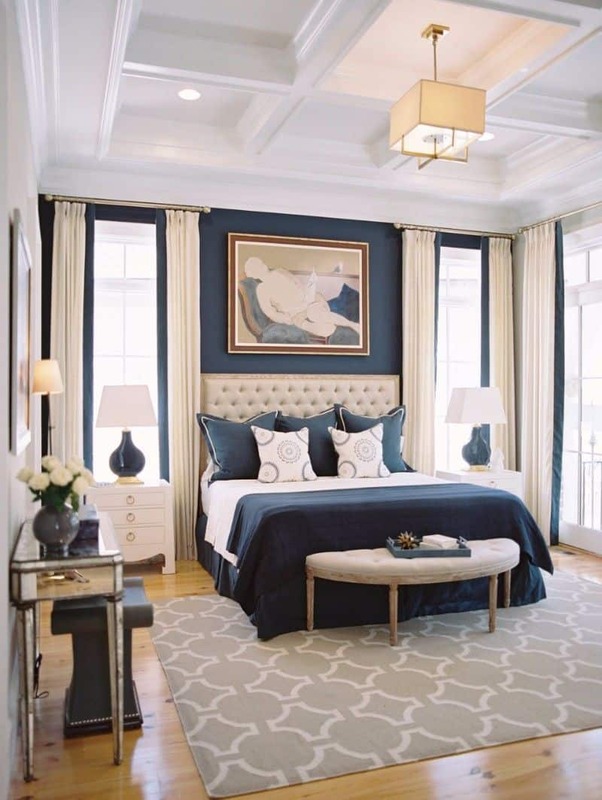 The room will appear put together while the soft pastel hues will enhance the richness of the navy. You want to white, beige or even pastel pink for the perfect balance between the shades. 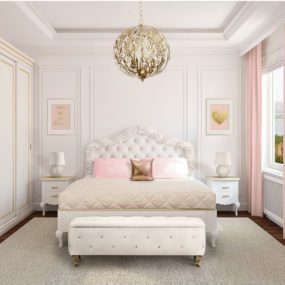 Ever wanted an elegant bedroom but didn’t think you can achieve it because of the size of your bedroom? If that is the case, then using a navy-blue palette paired with pastels will make the room appear elegant while still having that statement of a soft neutral all at the same time. It’s the perfect palette compromise. The key to working with neutrals is doing it correctly. You want colors that standout within the neutral shade range. The idea is to create a palette that seamlessly flows throughout. Doing so will keep the bedroom fresh and cozy while still having a great atmosphere. 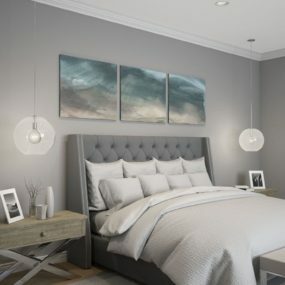 If you have a small bedroom your first thoughts may be “great now the room must be neutral so that it appears larger!” This is not always the case. 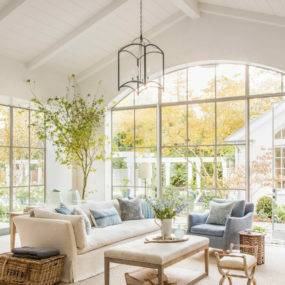 Although, neutral shades do work well to make a room appear large you can work with neutral hues in different color ranges for an excellent outcome. Consider using beige, grays, browns, and blacks in different hues while mixing and matching them together. A great way to match your furniture to your wall is to have an all-white bedroom. Doing so will keep everything crisp and clean while expanding the size of the room. You can choose different size and style furniture the key is to maintain the same color flowing throughout. While it is a known fact that large furniture pieces do not work well in a small bedroom because they overpower the space. There are exceptions to the rule, the first being matching your wall color to your décor will redirect the attention and make the room appear cozy instead of overwhelming. Keep the colors in the same shade range. Wallpaper is great because it can give you the 3D feel that you may want without having to use elaborate paint. You can choose to use a bold hue or even a neutral in a bold pattern. The pattern you select will determine how color is incorporated into your current decor. Wallpaper can be underestimated and sometimes even overwhelming. 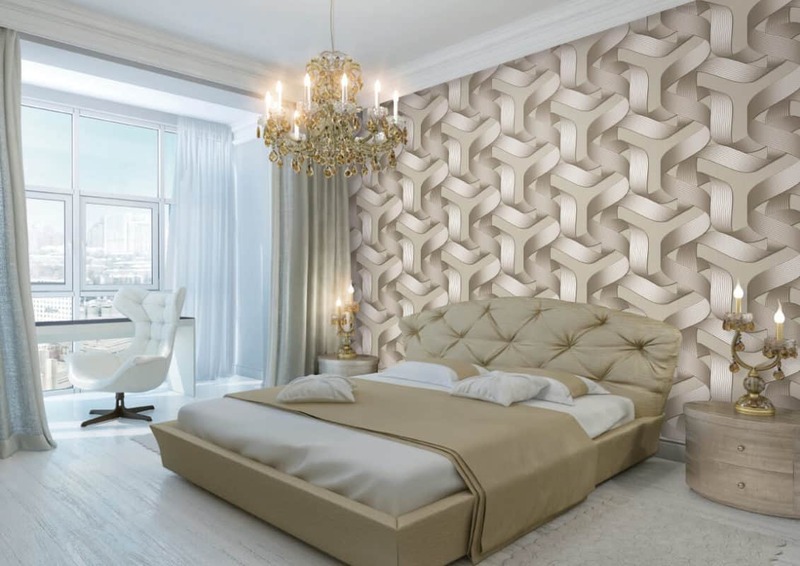 However, wallpaper is perfect for adding a touch of “wow” to the bedroom without having to add or subtract from the room. The key is choosing something bold that will stand out and make the space come to life. Stripes are great in the bedroom because they expand the space while bringing a new color scheme to the room. 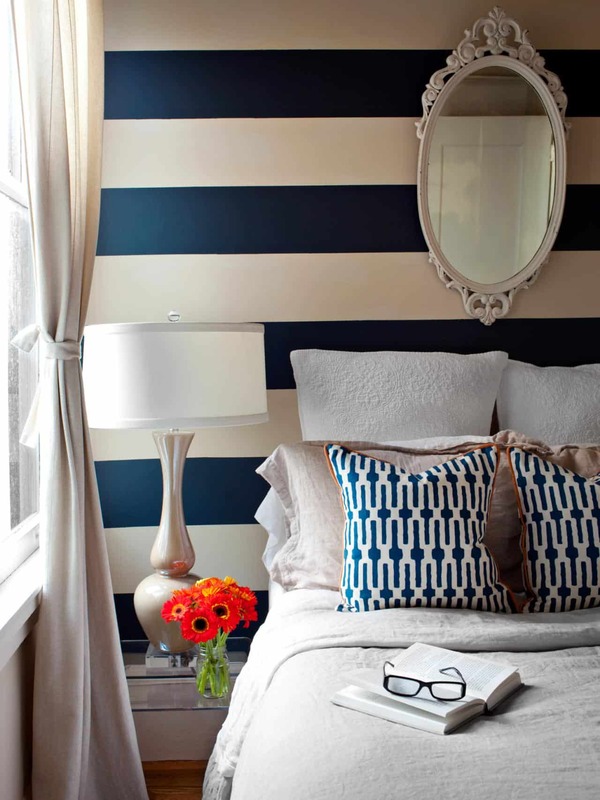 Adding a striped wall works great because it adds texture to the room in a bold manner. You can coordinate your wall with other patterns in the room for a cohesive appeal. We mentioned wallpaper and now we shall mention striped walls. Striped walls are great because they add a focal element to the room in a simple manner. The stripes just work beautifully together. This is the best aspect of it. Choose neutral or pastel stripes for an expanding effect. 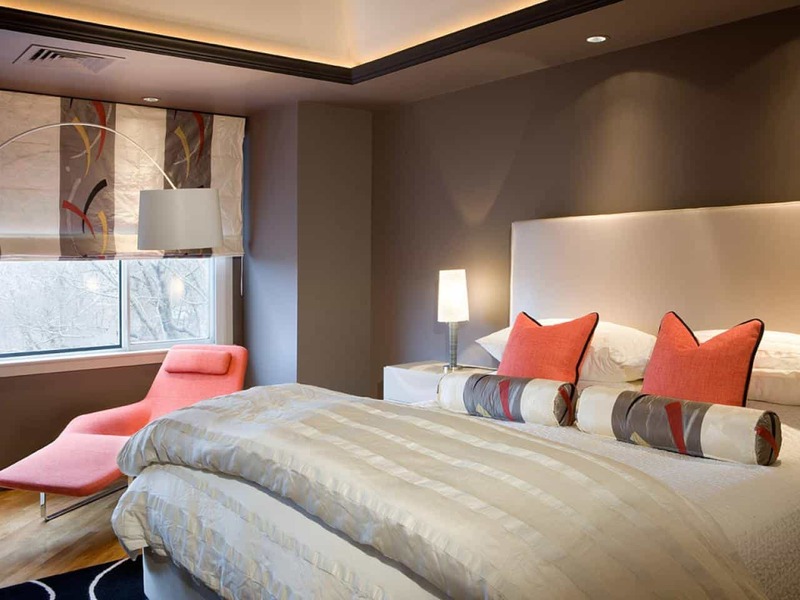 Pop of color works in any bedroom setting because it adds a focal point to the area. 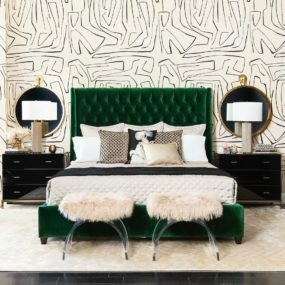 Choose bold hues that work well in the space without having to add patterns or other textured pieces, they should be able to stand out on their very own. Pops of color are great! They brighten the room while providing a fun twist to your décor. Choose a vibrant hue that will make the room come back to life. The key is using the same color throughout the entire room. 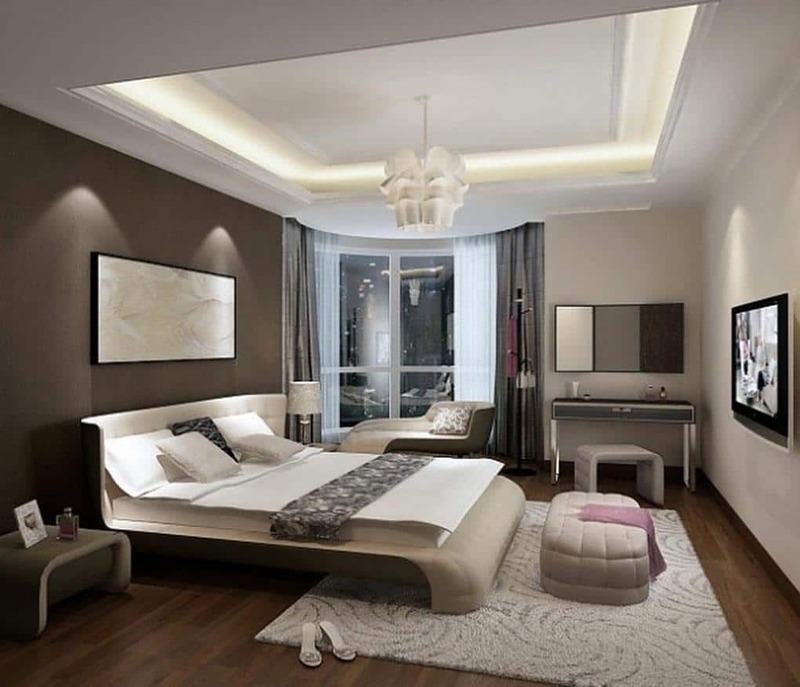 The light fixture you use will make a world of a difference in how big your bedroom appears. Pair a large light fixture with smaller lighting fixtures throughout the room. Doing so will expand the size of the room with little to no effort. You can even add colorful light fixtures to add an intricate focal point. 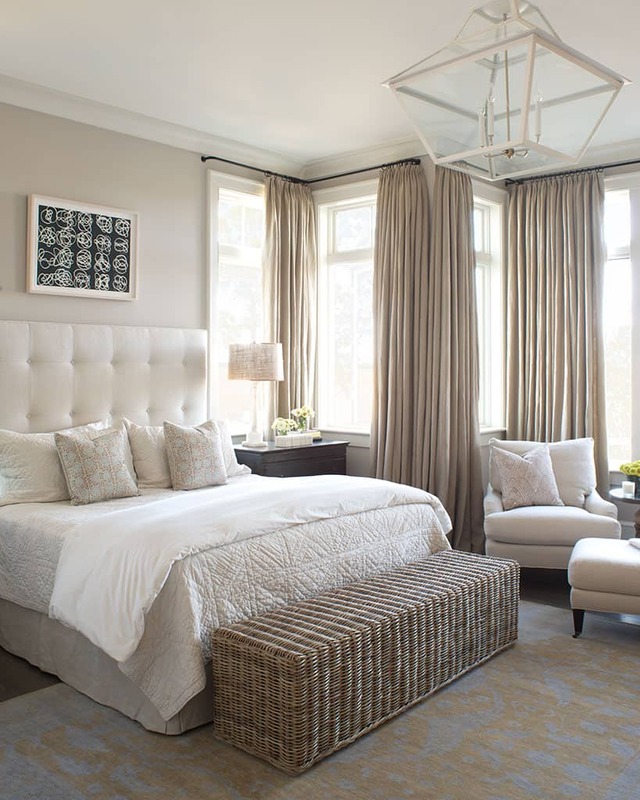 Light fixtures are a must in any bedroom, but it is exceptionally true for smaller bedrooms. You want to have chandeliers and other light fixtures that bring light to the room making it appear large and airy. Choose light fixtures that add a touch of charm. Doing so will bring it all together at once. 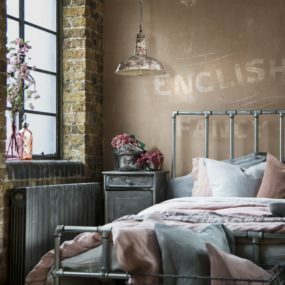 An accent wall is perfect for any space of the home especially, in the bedroom. You can add a gold hue or even construct a unique wall like the one pictured above. The idea is to have a wall that stands out from the rest of the room. This creates a focal point that is much needed. Add an accent wall to the room to pull in the décor in one direction. This can be done with wallpaper or with a bold shade of paint. The idea is putting it in the room and allowing it to do its magic. Use soft use around the wall for the perfect pairing. 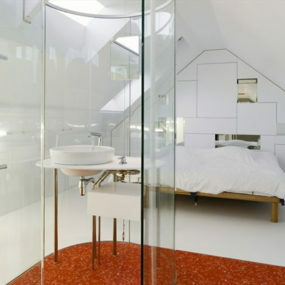 You small master bedroom does not need to be conformed to the same old boring colors you are used to. Try one of these tips to redecorate your room and truly make it feel like your own.